← MASSIMO FAGGIOLI. ‘La Civiltà Cattolica’ rails against prosperity Gospel and its support for Trump. ROSS BURNS. From Deraa to Deraa. Syria’s seven-year conflict is favouring those who play the long game. The flag of the Syrian government was raised again over central Deraa on 12 July, more than seven years after the first popular demonstrations against the Assad regime broke out in the city in March 2011. The symbolism is self-evident, but perhaps even more significant is the speedy progress Syrian forces have made in their effort to reopen the main border crossing with Jordan at Nasib. “Reconciliation agreements” have marked the rapid pace of advance by Syrian forces in the area, indicating that the fight has gone out of the rebel groups that held patches of territory east and north of Deraa. Anecdotal reports signal that the rebels have been persuaded to depart partly by local residents who have been convinced for some time that the struggle is unwinnable. Other potential flashpoints remain. West of Deraa, on the volcanic plain that stretches to the Golan escarpment, another patchwork of rebel groups includes residual elements of Islamic State hemmed in by other Islamist and militia elements. 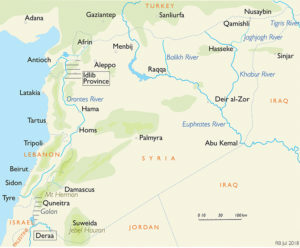 Israel is keen to see Islamist forces, particularly Hezbollah, kept away from the disengagement lines west of Quneitra. West and north of Aleppo, meanwhile, Turkish forces occupy the Afrin Valley and the hill country stretching around Aleppo from the west. To the east, the territory from Menbij to the Iraqi frontier has been taken by a joint American–Kurdish operation, its future undefined. Other areas outside the Syrian government’s direct control include much of Idlib province, the destination for fighters who refuse to accept “reconciliation” deals with the government. 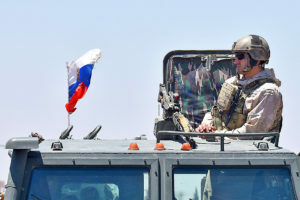 Significantly, all the reconciliation deals have been negotiated under Russian supervision, and Russian military police and other units have monitored the local ceasefires. Russia is also acting as intermediary between Israel and Iran to ensure that Iranian-sponsored Hezbollah units are kept well back from the line of division on the Golan. Turkey’s role in the north is less easy to define; in many ways it seems to be settling in as a long-term supervisory power. The real tinder box at the moment covers most of Idlib province south of the road running between Aleppo and Antioch. Its population has been augmented by rebels who refused to stay in the zones selected for reconciliation deals over the past three years, and the local, largely Sunni population is consequently living in pitiful conditions. Little information emerges from what is effectively a “black hole,” filled with rebels armed with the light weapons they took when they were evicted and free of any stabilising outside presence. Internet postings indicate sporadic clashes between al Qaeda units and more secular competitors as well as firefights along the southern edge of the province immediately north of Hama. In eastern Syria, stay-behind Islamic State units survive in remote parts of the steppe on either side of the Euphrates, and there have been isolated reports of engagements with Syrian forces. And, finally, there is the curious case of the stretch of Syrian territory well to the east of the Jordanian border crossing at Nasib: except for its long common border with Jordan, and the fact that it straddles the main highway link to Baghdad, it is devoid of any sizeable population or strategic interest. All conflicts, no matter how visceral and violent, have a natural half-life. But like the civil war in Lebanon (1975–90), they can also linger senselessly. A turning point finally came in Lebanon when the Arab League, notably Saudi Arabia, stepped in as arbiters and re-established more or less the same power-sharing formula as the National Pact of 1943. In Syria, the situation is a little clearer: there is now every sign that the regime will survive and take control of virtually all the state’s territory, assuming covenants can be reached with residual occupation forces and with Syria’s allies in the conflict. The keys to this process are Russia, Turkey and Iran. Early in the conflict, Russia and Iran read the situation correctly and identified where their interests lay. Iran had been building relations with Syria since 1979, encouraging a greater role for Shiite Islam. The Soviet Union had been a long-term backer of Syria, though at some points during the rule of Hafez al-Assad, father of the current president, it was clearly bamboozled by the country’s complicated manoeuvring. After Hafez’s death in 2000, Russia probably found his son Bashar a little easier to read. Turkey, for its part, had been a backer of Bashar al-Assad’s mildly reformist economic agenda before 2011. It switched 180 degrees in the early stages of the conflict, allowing the rebels to use the Syrian border crossings as revolving doors — a policy it came to regret when Islamic State extended its campaign of violence into Turkey. The missing element was the major Western powers. Most of them read the protest movements of 2011 as another phase of the Arab Spring and hoped that, given the right encouragement, a tide of popular enthusiasm would sweep Bashar al-Assad out of power. This was a fatal misreading: Syria was not Tunisia or Egypt. The call for Assad to go offered no identifiable basis for a post-Assad order, but many Syrians believed that the democracies would follow through and impose a solution. Soon the encouragement turned more lethal, with the United States beginning to provide light weaponry. While the gesture was too ineffectual to make an impact, it deprived Western democracies of any role in calming the situation. When both Turkey and the United States turned a blind eye to the role of Gulf interests intent on unseating Bashar and reversing the drift towards a Shiite identity for Syria, the conflict flared to peak intensity. Perhaps a few lessons have been learned, but they may not be enough. The US presence in the northeast and its enigmatic foothold in the south may be a Pentagon armchair strategist’s idea of a claim to a seat at the final negotiations. But even a token presence can bring dangerous and unexpected outcomes. By inserting itself between Turkey, the Kurds, the local Arabs and the Syrian government, the United States faces home-grown skills way out of its league. In a recent paper for the Hoover Institution, the French political geographer Fabrice Balanche notes that all scenarios in the northeast of Syria suggest a no-win for the United States: “US troops could be pushed out of northern Syria, giving the Syrian regime and its allies free rein,” he writes. 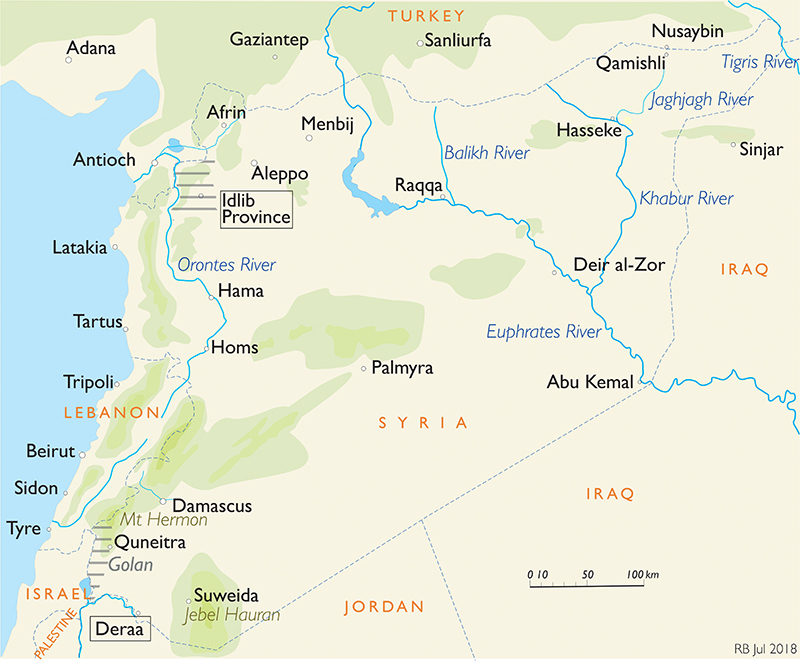 “Iran will then control the entire Syrian–Iraqi border and the corridor between Tehran and the Mediterranean Sea.” The US strategy, once again oblivious to complex dynamics on the ground, is likely to hasten one of the very aims it professes to oppose. Whatever credibility as a great power the United States had before 2017 is now irrelevant if Trump continues to see the world as akin to a reality TV show. Whether we like it or not, Russia, by contrast, has played its role expertly and consistently. Before 2011, it was a guarded marginal player in the wider region; now it holds a master key to any solution. So, too, does Iran. Adopting tactics designed to exclude Russia and Iran is simply counterintuitive. In a regional order clumsily forged by the 2003 invasion of Iraq, the likely winners will continue to be those who know the environment and play the long game. This article was published by Inside Story on the 20th of July 2018. Ross Burns was Australian Ambassador to Syria and Lebanon 1984–87. One Response to ROSS BURNS. From Deraa to Deraa. and not for the US. We hope the Syrians who come here make a good life.